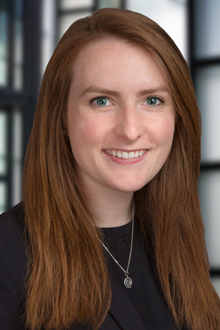 Ciara Dineen is an associate in the San Francisco office of Lewis Brisbois and is a member of the Medical Malpractice Department where she mainly focuses on dental malpractice. During law school, Ms. Dineen was a summer intern for the department of Medical Risk Management at the University of California, San Francisco. She also worked as a summer law clerk for the Law Foundation of Silicon Valley. At the Law Foundation, Ms. Dineen worked within the Mental Health Advocacy Program doing mainly housing law for people with mental health disabilities where she gained some exposure to disability law and benefits. She was also an extern at Indiana Legal Services, where she worked on a variety of issues.